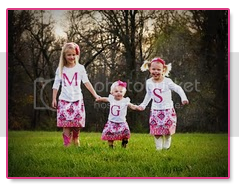 These girls are why I’m feeling a bit groggy and tired on this rainy Monday. From the left…my sister Adie, Karrie, me, Julie and Tahira. All my former SIU Softball teammates and friends for life. Steve and I hopped in the car and drove to Illinois on Saturday morning. Julie and Adie. The two pregnant girls in our group. and took a lot of pictures. Bust most importantly, we celebrated our good friend “Rat” (I just can’t force myself to call her Amanda) on her wedding day. Congratulations to the cutest couple, who deserve nothing but love and happiness. LOVE the pics...great time!! Our Friends are the BEST!! Please don't fail to notice the girl dancing next to me and compare the size of our arms!! Just a slight difference. Okay.HUGE.Difference!! Looks like a great time! I have 3 blog awards for you. Enjoy your day! Great Paint for the kids you found! & I'm loving your friends wedding dress ~ very chique. Looks like y'all had a lot of fun!